Alright, so I’ve only been involved in two my entire life, but they’re so fun! and it was such a nice experience, I wanted to participate again. on the forum, and who ever wants to participate, signs up. There’s usually a limit of 12 or so people, so you gotta sign up quick. and we have a certain amount of time to create and then mail her our 12 items. She will divide these up and make each one of us a box. Each participant will receive a package containing 12 different items! 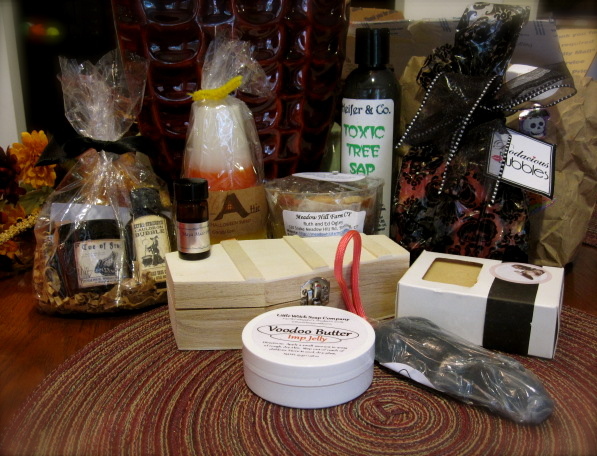 welcome swaps, and soaps using all-natural colorants. Basically a swap theme can be whatever anyone dreams up. It just so happens that both times I joined, it was a Halloween/Autumn themed swap. Fall is my favorite season, I’m all about the pumpkin! 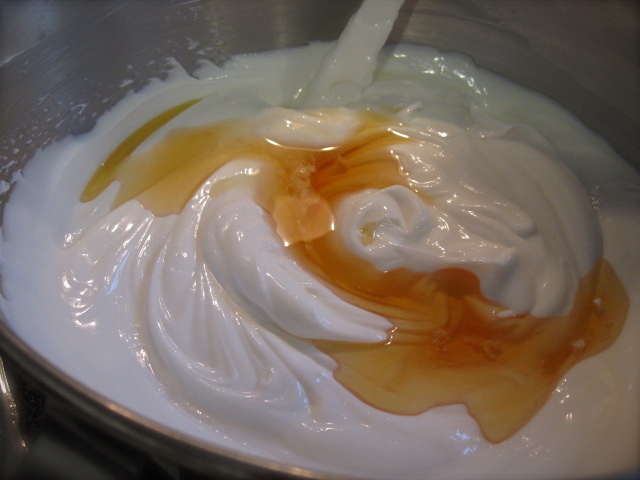 That beautiful amber liquid is pure vitamin E, being added at the ‘cool down’ stage. and I received a package in return, containing the twelve different items! I knew it was here, because the minute I opened the mailbox, I could smell it! I didn’t get a chance to go through it until the following night at around 9:30 pm. I hadn’t had a chance to open it yet! while slathering ourselves in delicious-smellling lotions and body butters. Then I put everything away, to wait for everyone to receive their boxes. Once everyone has gotten theirs, the postings and reviews will begin. 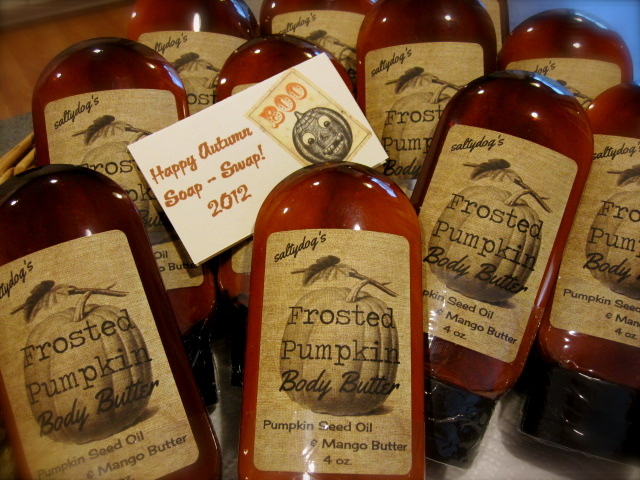 Posted in My Hand-Made Soap and tagged body butter, bubble bath, crafts, handmade, pumpkin, shopping, soap. Bookmark the permalink. What is it about the cupcake that makes it so appealing? so therefore, no sharing is required. Any pretty soap intrigues me, but I find the soap cupcake especially appealing. A yummy, decadent treat to use and enjoy. So much so, that you almost feel guilty doing it. With a case of the guilts, ya gotta be strong and shake it off- use the soap! if you cut them in half vertically. They will fit perfectly in the palm of your hand. 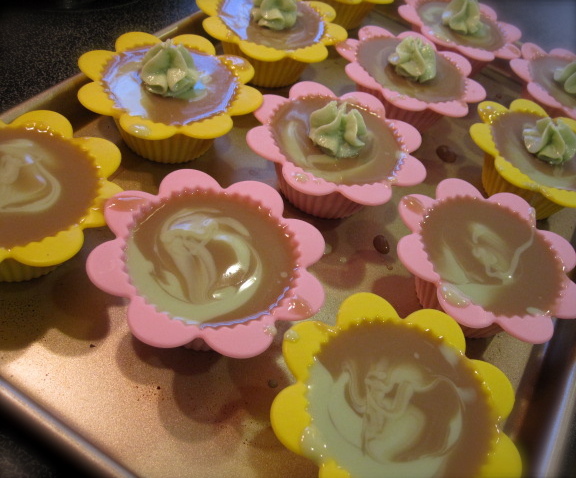 I’ve made soap cupcakes only a handful of times. This week I took some time off from work, so I’ve been getting my soaping on. so I went with what I had on hand. so I decided to go with that. I divided my soap batter into three parts. the other part scented in chocolate. The last portion I saved for the ‘icing’. I wanted to color it green, so I scented this portion in the mint. Mint fragrance oil doesn’t discolor like chocolate & vanilla scents can. to it, just because it smells incredible! I was having so much fun, I decided to make some Pumpkin-Caramel Delights. who wouldn’t like a little Pumpkin Delight? Pumpkin, lemon, caramel & a touch of chocolate. And it’s mine, all mine! 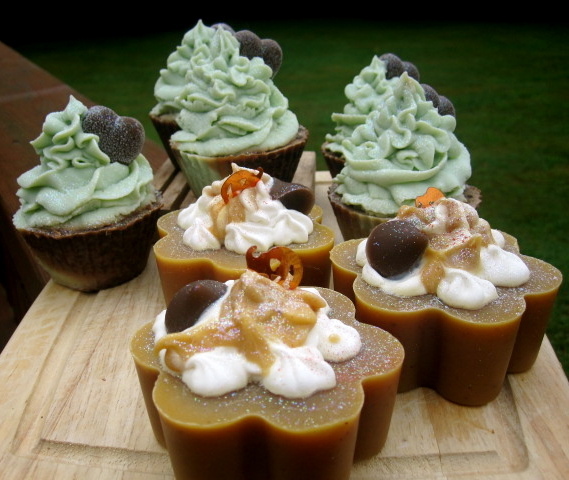 Well, one of them is, I’ve had my eye on on it..
Posted in My Hand-Made Soap and tagged cake, caramel, chocolate mint, confections, cupcake, pumpkin, soap, whip cream. Bookmark the permalink. And it’s not by 50 Shades. It’s by the weather. It’s hot soup out there today, although I shouldn’t say that, because under the right circumstances, I really enjoy soup. My face contorts involuntarily each time I must step outside. I’m sorry, but I think it’s disgusting. I’m holed up in my air conditioned house with my dog. She won’t stay outside for any length of time, either. Now, I know there’s those of you among us that absolutely love, love summer-time. I don’t mean to offend, but I am not one of them. Neither is my son. Just the other day, he was talking about where he’d like to reside when he’s older, so that he can be cool and comfortable all the time. Shame on me, but I haven’t been to the beach once yet. It’s an awful lot of work, packing up all your beach-crap, hauling it all from here to there, and then paying $12 for parking, why? To sit in the skin-sizzling sun all day. I happen to think there is nothing wrong with my pale skin, thank you very much. Then, there’s the sandy, (and incredibly sticky?) ride home to look forward to. I’m done pretending. I’ve done it long enough, I’m coming out. I’m not a summer-lover, my apologies. Yes, I have guilt, but I can’t keep up this charade any longer. As I sit and write this, the sky is darkening. Soon the temperamental summer sky will open up and we’ll have another thunderstorm. For this I am thankful. Thankful that Mother Nature has offered this small token to our thirsty plants and lawn, but also because it takes the edge off of the guilt I feel for sitting so comfortably indoors. Autumn. Now, that’s a horse of a different color. Crock-pot dinners and roasted corn. Soft sweaters and wooly scarves, not to mention the heady smell of nearby wood burning stoves. A Lavender scented bath to warm and relax you before bed. These are good things, and I’ll take it over summer any day of the week. I’ll be honest; yes, I realize it’s only July, but I’ve got all things pumpkin on my mind..
Hey, Ma! Look what I made! 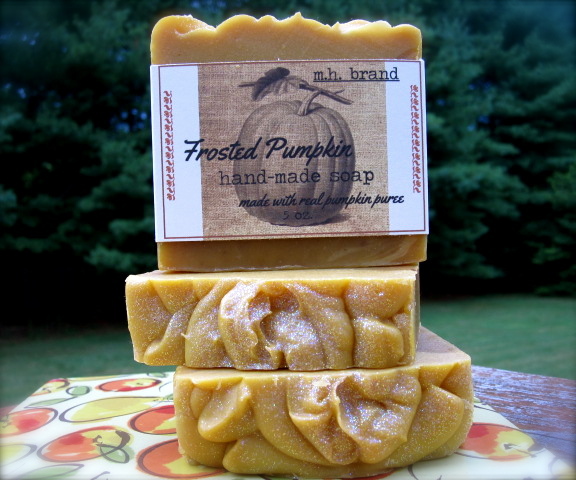 Have you ever tried pumpkin soap? Frosted Pumpkin by Nature’s Garden for this particular loaf. Sounds good, but I describe it as October. Don’t mind me, I hope you enjoy your summer. Posted in My Hand-Made Soap and tagged cooking, fruit and vegetable, Halloween, home, mother nature, October, olive oil, pot-roast, pumpkin. Bookmark the permalink.